Here we have four of the fifteen grandchildren of Marjorie Cox, carrying on with the Crazy Daze tradition. They’re standing in Bridge Square, showing off their prized purchases. 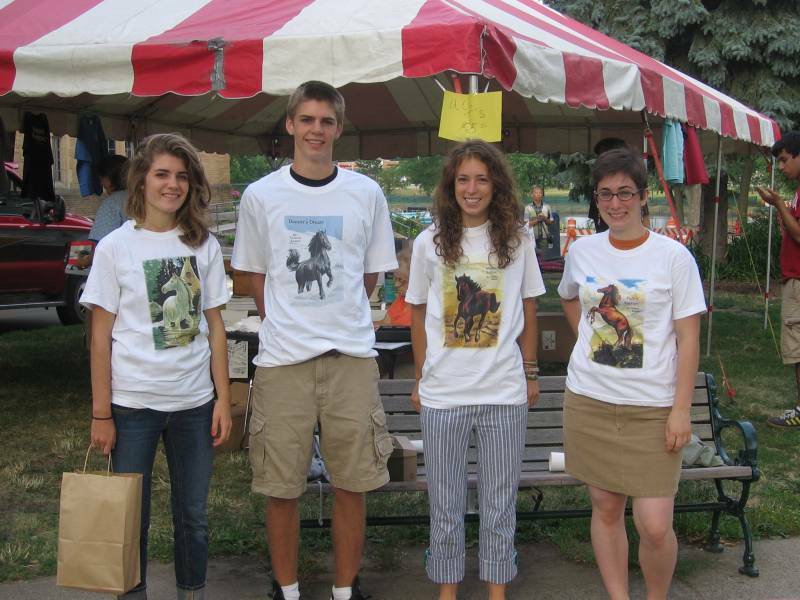 Marjorie was no doubt smiling down upon them; the t-shirts came from her beloved Northfield Historical Society…and were bargains to boot! I’ve already scored from The Rare Pair, Champion Sports and River City Books, and the event has only been open for a little over an hour. Now it’s time to head further south, perhaps to Present Perfect, Monkey Reads and Fine Groove. Yeah, I’ve had my Alaskan Doughnut but I’m already thinking about pizza from B & L’s…and then there’s ice cream treats, north at Sweet Pea’s Toys and Treats. Oh my gosh, look at the event schedule, in just over an hour, at 10 am, there’s Pedal Cart Races at Equine Outfitters, the Chicken Cannon at Hot Geeks, and Watermelon Seed Spitting at Just Food. I’d better get going. So, come on down(town) and join in the fun!